Earlier this month, Sven Stammberger was selected as a U Sports Top 8 Academic All-Canadian for the 2017-2018 season. 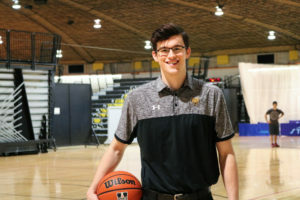 The former captain of the Dalhousie Tigers men’s basketball team, Stammberger is the 14th student-athlete from Dalhousie University to be honoured in this way since 1993. Only McGill University has generated more Top 8 Academic All-Canadians. Stammberger believes Dal student-athletes have been this successful because the university is so accommodating. 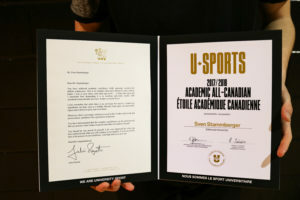 U Sports student-athletes are recognized as Academic All-Canadians by maintaining an average of 80 per cent or higher while competing on a varsity team. 3,600 student-athletes across the country, including 97 at Dal, achieved this during the 2017-18 season. Out of those recipients, one female and one male from each of the four U Sports conferences were selected for the Top 8. Those eight will be honoured on Jan. 29 at Rideau Hall in Ottawa. “To be recognized as U Sports Top 8 Academic All-Canadian is an honour for me and it just shows the work I’ve done,” said Stammberger. In his first year at Dal, Stammberger practiced with the Tigers, but got no playing time. Once on the team, he played only 30 minutes in his first year of eligibility as his season was cut short by a broken wrist. He worked his way up from there to a dominant role. He was the leading scorer for Dal in 2017-2018, with 18.4 points per game, and led the team in rebounds, getting 8.2 per game. Last year, he was named an AUS First Team All-Star and a U Sports Second Team All-Canadian. Not only a force on the court, Stammberger was also named the 2018 U Sports Ken Shields Award winner for Men’s Basketball Student-Athlete Community Service. The women’s basketball coach Anna Stammberger is also Sven’s mom. “What we always wanted and expected from our children is that they have integrity, that they work hard at whatever they do and that they help others,” says Anna Stammberger. She also gives credit to Sven’s high school and university coaches, teammates, and Dal athletics to help Sven succeed. After five years of playing varsity basketball, Stammberger is now completing his Masters in Business Administration in Corporate Residency. He says his education was always a priority, regardless of how well he performed on the court, because he knew his athletic career would eventually come to an end. “Once we are done with school we have to look forward to do new things,” said Stammberger. He’s taken the work ethic and dedication he put into basketball and applied it to other areas of his life. Last year, Stammberger earned a spot in an exchange program at the Copenhagen Business School in Denmark, which took the top four students out of the 45 in his class. After completing his MBA this year, Stammberger hopes to play basketball in Germany for a few years. As a student-athlete, Stammberger was a student first and an athlete second, and he believes that is a key part of being successful.